Wooden Danmark Tall Model Ship 14"
Wooden John Halseys Charles Pirate Ship Model 20"
San Felipe Limited Tall Model Ship 38"
Wooden John Halseys Charles White Sails Pirate Ship Model 20"
Inspired by the Danmark, a Danish naval training ship transferred into American custody during World War 2, this adorable tall ships model cutter rests easily upon any shelf or desk. 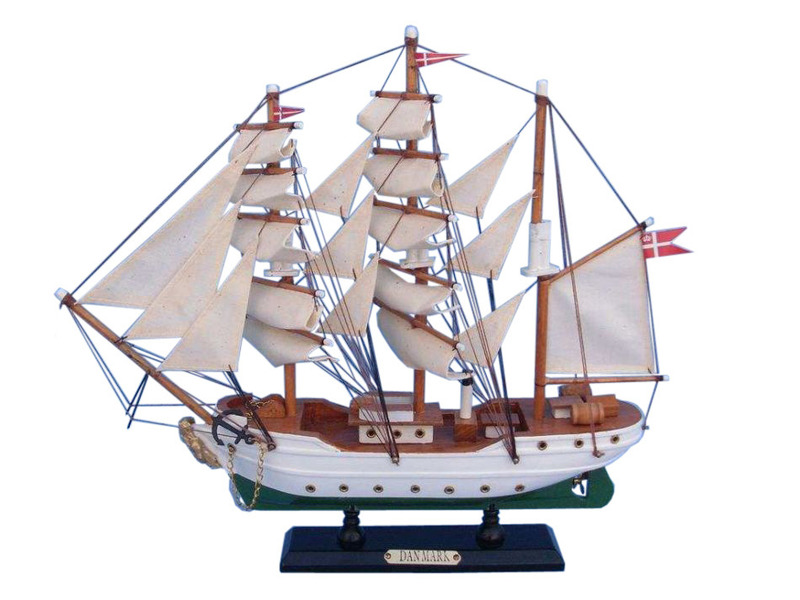 Add a touch of nautical history and pride to the décor of any room with these beautiful tall ships models. During World War II, Denmark became occupied on April 9, 1940 while the training ship DANMARK was on a routine training mission in U.S. waters (Jacksonville, Florida). In agreement with the Danish Ambassador to the United States, the Honorable Henrik Kauffmann, Captain Knud L. Hansen placed his training ship at the disposal of the U.S. Government; however, neutrality prevented the acceptance of the offer until December 7, 1941 when Pearl Harbor was attacked. From that point onward and until the end of the World War II, DANMARK and Capt. Knud L. Hansen served under the Stars and Stripes training some 3000 U.S. officer cadets. These young men received a first-class education in responsible seamanship under Capt. Knud L. Hansen’s capable leadership and strict discipline; later they would serve in the U.S. Coast Guard. The First Officer of DANMARK during the war was Knud Langevad, and he was in charge of training the U.S. cadets. 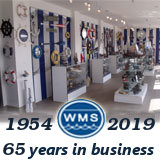 He also convinced U.S. authorities of the value of learning seamanship on a tall ship, and following the war the U.S. Coast Guard purchased its well-known tall ship the U.S. EAGLE, to replace the DANMARK. This close Danish-American teamwork lasted until September 26, 1945, when DANMARK and her Captain were returned to the Danish Government with full honors. The Danish gesture is still remembered and appreciated in the USA. Reflecting the special kinship between the DANMARK and the U.S. EAGLE, DANMARK sails as the first foreign ship behind the U.S. EAGLE in official Tall Ship Parades. This was the case on July 4, 1986, when DANMARK was honored with the number two position sailing behind the U.S. EAGLE during the Parade of Tall Ships celebrating the 100th birthday of the Statue of Liberty, and again in 2000 when the DANMARK sailed as the first foreign ship behind the U.S. EAGLE during the Millennium Voyage of Tall Ships along the East Coast from Miami to Boston. Built in 1933, the DANMARK is a steel-hulled, three-masted fully-rigged ship. It has served as training vessel for young people seeking careers at sea. The ship is property of the Kingdom of Denmark and is capable of sailing around the world. The ship has 26 sails and 236 ropes. A main engine is used in low wind conditions. The ship has a permanent crew of 15 consisting of: Captain, Chief Officer, Chief Engineer, Doctor, Deck Officers, Electrician, Chief Steward, cooks and quartermasters. DANMARK has 80 trainees – young men and women ages 17-23 whose voyage is part of a basic training program to qualify for a career in the merchant navy. Training consists of safety, navigation, seamanship, watch duties, hygiene and English. Teamwork, flexibility are also important qualities developed to make the ship sail in a safe and efficient manner. When signing on the DANMARK, the trainees meet the challenge of living, studying and working in a maritime environment which is intense and challenging. They all sleep in hammocks during a cruise which lasts 20 weeks. Their private life is limited to the hammock, a small cabinet and a small locker. The trainees perform nearly all the practical tasks, watch duties etc. on board under the supervision of the crew. They are also taught theoretical subjects by the crewmembers. The working hours can be very long – up to 10-12 hours daily divided in watch duties, practical work and theory lessons. The DANMARK forms an excellent teaching environment which combines theory and practice. The trainees achieve technical and social skills difficult to obtain in traditional training environments.